Fiat's sporting brand Abarth has produced its own version of the Italian maker's 124 Spider roadster. It offers extra performance an improved handling but inevitably, there's quite a premium to pay for that. Jonathan Crouch takes a look. The Abarth 124 Spider is perhaps is the most serious Abarth model we've ever had. Previously, all Fiat's in-house tuner had brought us are various tweaked versions of the little Fiat 500 citycar. This Abarth 124 Spider in contrast, is much more of an Abarth model in its own right. And, with 170bhp on tap, promises to be a lot of fun. Takes you back doesn't it? The thought of a proper little Italian open-topped sportscar we mean. Fiat's modernday 124 Spider model offers that, but the most power you can have beneath the bonnet there is 140bhp. This Abarth variant ups that figure to 170bhp and draws upon a rich model heritage that goes all the way back to the first Abarth 124 model that was made in 1972. Like its Fiat originator, this model is based on the underpinnings of a Mazda MX-5, but in this case, you feel that so much more has been done by 'Officine Abarth' to differentiate this model. British buyers certainly seem to think so. 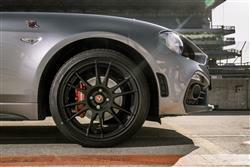 The UK is Abarth's biggest market, larger even than Italy. 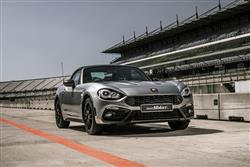 The changes that have created this Abarth 124 Spider over the Fiat model aren't just limited to increasing the power of the 1.4-litre MultiAir petrol engine from 140 to 170bhp. It's probably more important to note that this Abarth version gets the mechanical limited-slip differential missing from the ordinary Fiat model, and while it shares the mainstream Spider's basic suspension, it uses race-orientated Bilstein dampers, not to mention its own specific tune of anti-roll bar and spring rates. The 17in alloy wheels are different too, shod with stickier Bridgestone Potenza RE050A tyres and there's uprated stopping power courtesy of Brembo four-piston brakes at the front. The gearbox isn't of Italian original - it's lifted from the Mazda MX-5 design donor car - but that's no hardship as the transmission in question is a brilliant short-throw set-up that we think enthusiasts will love. As you might expect from the fairly modest power increase over the standard Fiat model, the performance isn't massively quicker than that car. Still, rest to 62mph in 6.8s should be quite as quick as you'll need to go, courtesy of a light kerb weight of just 1,060kg, which has led to an enviable power-to-weight ratio of just 6.2 kg/HP. There's the option of a paddleshift auto transmission but most buyers will want to stay with the 6-speed stick shifter. You won't miss this car, that's for sure. The most distinctive visual touch is the imposing black bonnet which is a classic Abarth design cue - apparently. 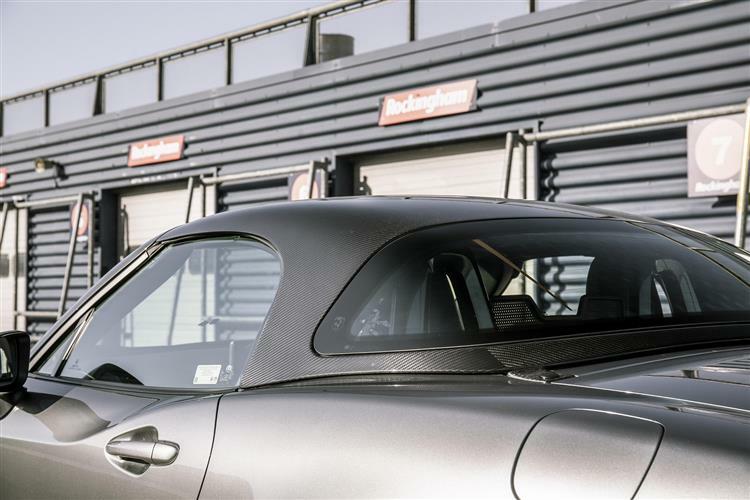 The black rear spoiler is another Abarth model giveaway and below that lies a dual-mode 4-outlet exhaust that varies exhaust flow depending on the engine speed. Inside, there's what Abarth describes as an 'Alcantara Racing' interior: it certainly sets a purposeful note that's also echoed by the sports steering wheel and pedals. The convertible roof is borrowed from the Mazda MX-5. It's the kind of simple, manually-operated fabric hood that a car of this kind should have, light and easy to use. Opening or closing it requires little effort, so it's easy to reach behind you and pull up the roof with one hand, a process that only takes a few seconds. Why would you want to wait for electric motors to whir into action when doing the job yourself is so simple? Out back, the boot is 10-litres bigger than an MX-5, but that still doesn't mean it's very large, the capacity limited to 140-litres. Pricing starts at around £30,000. 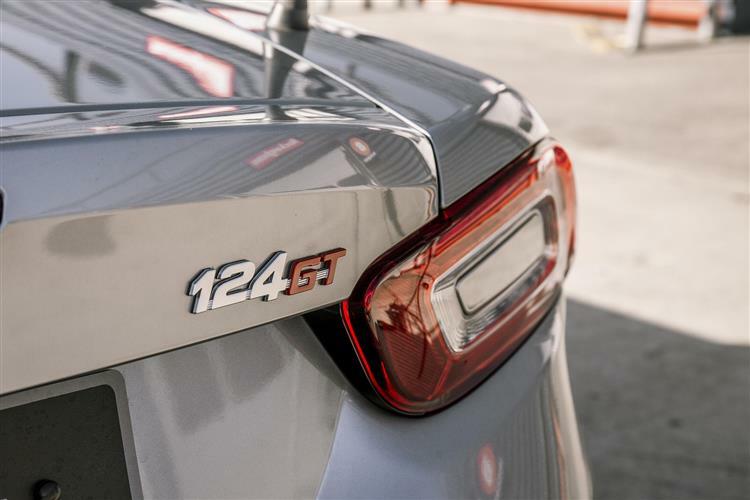 This means that for this more focused 170bhp Abarth model, you're having to find a premium of more than £6,000 over the priciest version of the ordinary 140bhp Fiat 124 Spider. That seems rather a lot. If you're not put off by that, you might also want to consider finding another £2,000 for the paddleshift automatic gearbox. We'd advise against it though. Swapping cogs yourself is really part of what enjoying this car is all about and the standard manual 'box is brilliant. As for equipment, expect to find a seven-inch infotainment system as standard, complete with satellite navigation, 3D maps and a rear parking camera. There's also leather/alcantara upholstery, automatic climate control, front fog lamps, adaptive LED headlamps, automatic lights and wipers and a high quality sound system. If that's not enough, then there's an auto-only 'GT' version, priced at just under £34,000. this comes as standard with a carbon fibre roof, 17" OZ Ultra-Light alloys, a Bose sound system and a Visibility pack including dusk and rain sensors, rear parking sensors and adaptive front LED headlights. The running cost efficiency of this 170bhp Abarth 124 Spider isn't any different from the 140bhp Fiat version. That means 44.1mpg on the combined cycle and 148g/km of CO2. For reference, the figures for a directly comparable 1.5-litre normally aspirated Mazda MX-5 are 47.1mpg and 139g/km. What else? Well there's a three-year unlimited mileage warranty, which is slightly better than the class norm. Residual values will be strong and maintenance costs should be as affordable as they usually are for Fiat and Abarth models. Plus you can organise servicing visits more easily by taking advantage of the 'my:Car service' feature that's been built into the 'Uconnect LIVE' aspect of this car's infotainment system. This gives you an interactive vehicle handbook and real time servicing reminders that can be set to work with a 'Uconnect LIVE' account you can set up on your smartphone. Here's one for enthusiasts only. The kind of person who'd really rather like a Caterham or a Westfield but just can't quite face living with something that crude day-to-day. An Abarth 124 Spider gives you the kind of back-to-basics racing feel you get with roadsters like that, but embellishes it with a bit of luxury and practical usability. You can see the appeal. It's easy to point at the huge price premium this Abarth demands over its Fiat counterpart and say that it can't be justified, but look a little deeper into what this car offers, then drive one and you might change your mind. It's special: sometimes, it's hard to put a price on that.